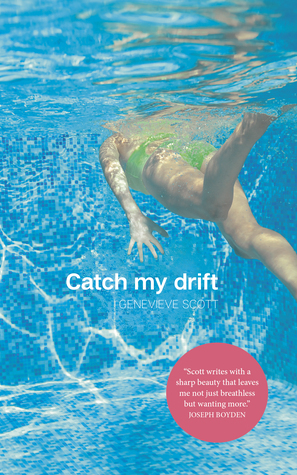 Catch My Drift is a compelling novel about a mother and daughter, living together while also living their own private lives. Over the span of twenty years, the chapters alternate between Lorna’s story (in third person) and Cara’s (in first). There was a time when Lorna felt more bitterly about her choices, about the life she missed out on… Ten years ago, if a little genie had turned up with the offer, she would almost certainly have gone for a do-over of her life. She had devoted serious thought to the moment she would go back to in time – sometime before the accident, obviously, but sometime before Kenneth? She would run through the possibilities – the pros and cons – as though this were an actual real decision she would someday get to face. She lay in bed in the morning, waiting for her children’s fussing to turn serious, stealing time to consider the question. After we learn how Lorna came to be the mother of two – Jed and Cara – at a young age, the story fast forwards to 1987 when Jed is 13 and Cara is 11. Lorna and Alex (their father) are still together, but just barely. Lorna is practical and does what needs to be done for her family, but Alex is still trying to hold on to his carefree ways. At one point he even joins a commune. Unsurprisingly, they part ways, and now have to navigate separated parenting. Alex had always had a woo-woo side, a grand faith that something was out there, something that he could find and unwrap, that could make his life better, that could make him the man he wanted to be. For months, maybe even years, she’d had a kind of awareness that Alex wasn’t faithful. But it was like being aware of the smell of rot somewhere in the house that was persistent yet mild enough to put off looking for. Why search for something you don’t quite have the energy to fix? It wasn’t laziness exactly, but maybe related. The hardest part about finding the notes was that now she knew, and she had to do something. From Cara’s perspective, it’s clear that she is strongly influenced by the people around her. She’s an impressionable, anxious child (For example, when Cara learns that Mary was only 12 when she became pregnant with Jesus, she begins to worry that the same could happen to her if God decided to have another child.) with compulsive tendencies – tapping on certain things 7 times each gives her a sense of security. She also plays pessimistic superstitious-type mind games to determine the outcome of certain events in her life, rather than taking control of things herself. Sometimes she becomes angry enough to fantasize hurting someone. Maybe if I do something a little bit bad, the very bad thoughts will go away. People get sappy about the past because everyone’s always smiling in pictures. I’m sure everything sucked as much then as it does now. The beauty of this book is in the details of their daily lives and their inner thoughts. Lorna is just a person doing her best as a mother. Cara is just a person doing her best to grow up into someone she likes. Lorna tries to understand her (or assumes that she already does), but the reader can see how different Lorna and Cara have turned out to be. There were many times while reading this book that I wanted Cara to just spill her guts to her mother. She doesn’t breathe a word about her fears and dark thoughts. I couldn’t help but wonder how her life might have been different up to this point had she opened up and tried to get help with her anxieties. But I also understand the desire to keep it to yourself – I probably would have done the same as a child – the reluctance to add any more worries to our parents’ overflowing plates. Her daughter didn’t appear to have any sense of self, any special interests… it seemed that being noticed was the last thing Cara wanted. Even the way Cara walked seemed intended to achieve invisibility: shoulders in, arms crossed, like she didn’t want to be looked at. Like she might prefer to just disappear, even from her own mother. One thing that struck me while reading this book is how hard Lorna worked. She worked full-time outside the house. She took her job as a parent seriously. She even worked hard to keep Alex from getting too distant from their children – he was often like a child himself – but Lorna knew it was important for her kids to know their father cared about them. Because of the way her life turned out, Lorna pretty much gave up having a life of her own. She worked and she continued to swim recreationally, but other than that, she had very little social life. The other thing that struck me is how little thanks she got for it. Jed tunes out and takes off, Cara is wrapped up in her own thoughts (much like most teens), while Alex has moved on with another woman. Mom remembers everything. These days she’s constantly getting watery-eyed over old stuff. Even on a regular weekday morning, she’ll be in her bathrobe, scraping her spoon inside an empty yogurt container all, “Remember your first window plant? Remember how big it grew?” I’ll lie and tell her I have no idea what she’s talking about sometimes, just so she’ll get over it. You can’t just sit around remembering things all the livelong day. How about you – have you read any good mother-daughter books lately? Books that make you think about how little control we actually have over our children’s lives? Books that demonstrate how our lives can change on a dime? I finally got around to reading Deborah Levy’s Hot Milk, a rather different take on the mother-dauthter relationship, told entirely from the daughter’s perspective, but also a compelling one. It’s nice to read a review of this fine novel from a parent’s perspective. Well done! It broke my heart that Lorna and Cara were so distant, but nice to see Cara softening up a bit at the end. Given my own relationship with my mother, I’m not big on reading these kind of novels. 😐 But you do write an interesting review highlighting why this might be a good read, and Inappreciate that. That should read: appreciate and not Inappreciate! Duh! This sounds like one I’d enjoy too. The cover reminds me of another novel (these stock images are starting to repeat it seems) but I can’t think of which one. I’m wondering if Leanne Shapton’s Swimming Studies would be an interesting comparison, as it considers her experiences as a young swimmer, and anxiety definitely played a role there too. In my own stacks, the two books taking most of my reading time these days both concern children and parents and how much they do/don’t intervene in the youth of their lives and how this involvement (or lack thereof) impacts them, now and later: Michael Ondaatje’s Warlight and Tommy Orange’s There There, two recent discoveries on the “new” shelves which have been distracting me (happily, though) from my backlisted reading this year. Either of them on your stack? Neither are on my stack, but both are on my list. I’m glad to hear they’re distracting you – that means they must be good! The cover reminds me of The Bone Cage – is that the one you’re thinking of? I really like the sound of this – I enjoy things about the inadequacy of human communication! It’s a bit scary for me to read about how easy it is for a parent to have no idea what’s going on in the mind of her/his child! Could only think of dysfunctional mother-daughter books! Gah, every time you review another mother/daughter book I am reminded that I bought a book called Mother’s, Tell Your Daughters at a book launch party and STILL haven’t read it! That was a few years ago. My favorite book about motherhood is probably Jenny Offill’s Dept of Speculation. I don’t tend to pick out books about mother-daughter relationships, but if the description appeals then I’ll choose one. Do you think you’d be more interested in mother-son relationships? I didn’t know that about your mother, Anne. I’m so sorry to hear it. I think your experience might make this book even more meaningful for you! Thanks Naomi, you’re probably right!